(More) Awesomeness For Your Wall! Hooray, the posters came! They turned out pretty nicely, if I do say so myself. Look, even Luke Cage approves! I will get in touch about where to send your posters to! Sorry to everyone who didn't win! OR... well, I've kind of bowed to popular demand, and I will now, after all, be selling some prints myself. It's a limited print-run of 250, and to make them even super-special-er, I'll be signing each one and doing an EXTRA BONUS sketch of the character of your choice. I've set up a new 'shop' page on my website to sell the things, so why not head over there and have a look? 2) the A-Z actually ended up costing me quite a lot of money in terms of bandwidth charges and stuff, and it would, y'know, kind of be nice to get some of that back. I'm a killer salesman, I know. ..oh yeah, and dinosaurs. Obviously. Once I came to this realisation, it was a very short jump to drawing the above bit of nonsense, drawn solely for my own amusement, and presented here for yours. 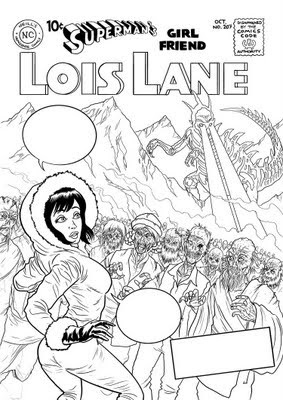 So yeah, it turns out that my dream job would be drawing Superman's Girl Friend Lois Lane, a comic which ceased publication three years before I was born. Hey, DC! If you ever do another run of Wednesday comics... well, I'm just saying. Actually, why not just go the whole hog and launch a new double-feature book, with Lois by me and Jimmy Olsen by Chris Sims and Matthew Allen Smith? Come on, it's a license to print money! (Please note: this may not actually constitute a license to print money). I have a feeling I may do more of these, so if you would like to suggest some random (awesome) elements for inclusion in future instalments of the Imaginary Adventures of Lois Lane, please do so in the comments. While I'm here - thanks to everyone who's said they'd like a copy of the A-Z poster I mentioned here yesterday - I'm leaving the 'competition' open till Monday, so if you haven't yet, just throw your name in the hat that is the comments section on yesterday's post to be in for a chance of winning one! Actually, a couple of people whose knowledge of these matters far outstrips my own have suggested that I may have been being overly cautious / overly stupid, and I might actually be okay selling some signed prints / posters of the A-Z after all, so... we'll see, I guess. 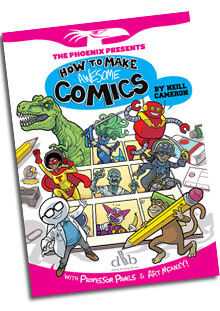 I finally got around to collating the A-Z of Awesomeness into one place! 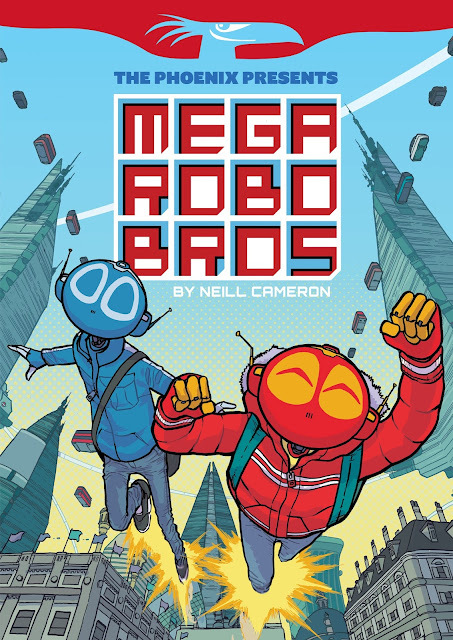 You can go and check out the entire A-Z in a new section I made for it over on neillcameron.com. Also, I'm getting a few copies of the above poster version printed up to give to friends and suchlike, and should have a couple left over, so thought I'd give a few away here. Say... 3? If you'd like one for your wall... well, just say so in the comments on this post, I guess. I will put names in a hat and pick three lucky, lucky people at random! EDIT: No more entries, please, lines are now closed. Thanks to everyone who joined in, I'll announce the winners in a bit. 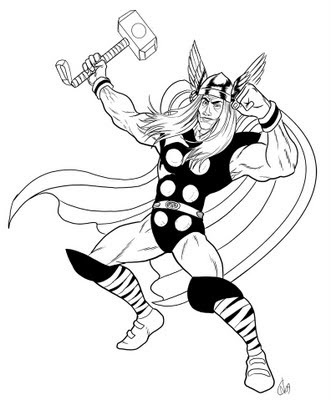 Thay, Don't Get Thor, Thee? Hey, here are a few pages of the Thor strip I drew for Panini's Marvel Heroes a while back. It came out last month or so, so I thought I'd post a few pages here now. Enjoy! 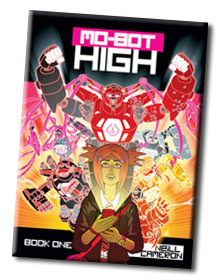 Script by rising comics superstar Kieron Gillen, art by me. Weirdly, I had this post lined up for today already, and then woke up to the news on Twitter that Kieron has landed the job of new writer on Marvel's (as in Marvel US, Proper Marvel) THOR series. Huge congratulations to the guy, fantastic news. I have kind of mixed feelings about how my work turned out here - it was my first go drawing superheroes since I was like 16, and it turns out it's actually prettty hard. Who knew? Anyway, I've done the A-Z of Awesomeness since then, which gave me a bit more practice, so I'm slightly more confident with the whole massive-biceps-and-implausible-poses thing now. Bonus art! Here's one of my warm-up /practise sketches of the big guy. I had a very pleasant time this weekend at Caption 2009 - met lots of lovely people, talked about comics and doodled me some pirates and dinosaurs. The first talk I went to was Karen Rubins talking about her current residency at the V&A - which sounds great, and I hope to pop along for a visit on one of her upcoming open days. I had a vague idea that I would sketch people at Caption during the talks, but decided against it in Kaz's talk as I thought it might be offputting and am never sure about the etiquette of drawing people without asking. 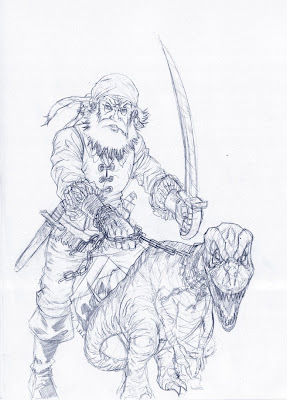 So I drew a pirate and a dinosaur instead. 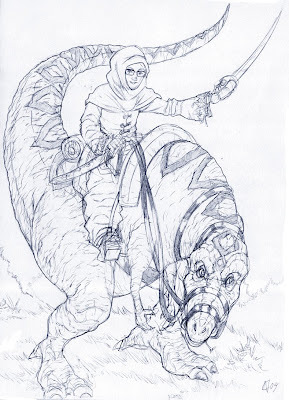 (I quite like drawing pirates and dinosaurs, as regular readers of this blog may have realised). Anyway, afterwards Kaz proceeded to draw me without asking - an uncanny likeness, she really captured my Mr. Potato-Head-With-Glasses quality - so apparently that's okay. She also said that if I'd drawn her as a pirate that would have been fine. Which gave me an idea for the rest of the talks. 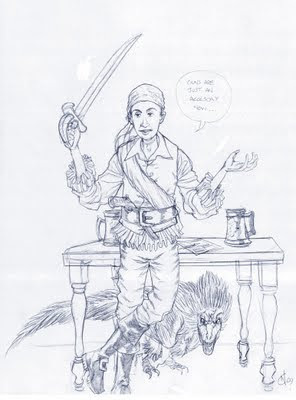 Here is comics creator Garen Ewing, as a pirate, with a dinosaur. Garen was talking about his book the Rainbow Orchid, which I have been telling anyone who'll listen about since, ooh, 2003, and Vol. 1 of which has recently been published to great acclaim by Egmont. It was fantastic to see some of Garen's sketches, character designs and pencils / inks during the talk - although the real highlight was getting a sneak peek of the cover to Vol. 2, which was just absolutely jaw-droppingly beautiful. The next thing I went to was Sarah McIntyre's talk about picture books, comics and the cross-fertilisation therebetween, and it was utterly fascinating - I spent the whole thing gawping at incredible work by artists I'd never heard of and trying to write down all their names, which kept me so busy I never even managed to finish my picture of Sarah as a pirate. Next up was Asia Alfasi talking about her work and her upcoming autobiographical book, which I can't wait to check out. Her story back in vol. 1 of Best New Manga was great, and a short story she had in Manga Jiman that dealt with her upbringing and moving from Libya to Glasgow was really interesting, so I can't wait to see a full-length book. Anyway, it was another really fascinating talk (hosted / interviewed by Caption organiser Jenni Scott) - but I somehow managed to find the time to draw Asia as a dinosaur pirate, anyway. As I say, a great weekend, and huge thanks to Jenni, Jay, Selina and the rest of the team for organising it. I think this was possibly my favourite Caption I've attended so far, maybe just because I didn't have anything to do this year but listen to the talks, catch up with friends and meet nice people. Or, maybe, because there was cake.